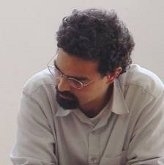 The Portuguese writer Gonçalo M. Tavares was born in Luanda in 1970 and grew up in Portugal. Beside his work as writer, he teaches Theory of Science at a university in Lisbon. Since 2001, Tavares has surprised his readers with the variety of his books and has been awarded an impressive number of literary prizes in a very short time. In 2005 he won the José Saramago Prize for young writers under 35. In his speech at the award ceremony, Saramago commented: “Jerusalém is a great book, and truly deserves a place among the great works of Western literature. Gonçalo M. Tavares has no right to be writing so well at the age of 35. One feels like punching him!” Jerusalém was also awarded the Prêmio Portugal Telecom de Literatura em Língua Portuguesa in 2007. Tavares’ work has been published in the USA by Dalkey Archive and in France by Hamy, as well as in other countries including Brazil, Israel, Italy, Mexico, Poland and Spain. In Germany, Jerusalem will be launched by the publishing house DVA/Random House in 2011. Recently, his novel Aprender a rezar na Era de Técnica has received the prestigious Prize for the Best Foreign Book 2010 in France. This award has previously been given to authors including Gabriel García Márquez, Elias Canetti, John Updike, Mario Vargas Llosa and António Lobo Antunes. This novel was also shortlisted for two renowned French literary awards, the Femina Étranger Prize and the Médicis Prize.